More Album Guests: Eli West! The first person I thought of when brainstorming my guest musician wish list was Eli West. I first met Eli at Targhee Music Camp and was blown away by songs he shared from his collaboration with artists Anna & Elizabeth and Dori Freeman from his then unreleased album The Both. He makes all the best musical choices and I knew he was the one that could nail the frailing banjo on the unconventional rhythms of “Destroyer” and bring some heartbreak electric guitar to “There is a Right,” the icing on the cake that is his distinct voice. It’s a dream come true having him on this EP, all communication and exchange done over the internet. It’s an amazing time to be making music and exploring what can be accomplished with all this accessible technology. This picture of Ben Winship, Eli, and Eric Thorin was taken at camp in 2016 by my camp pal/photographer extraordinaire Ed Coyle, just one of dozens of great friends I’ve made there. Ben was one of my first mandolin/songwriting heroes. 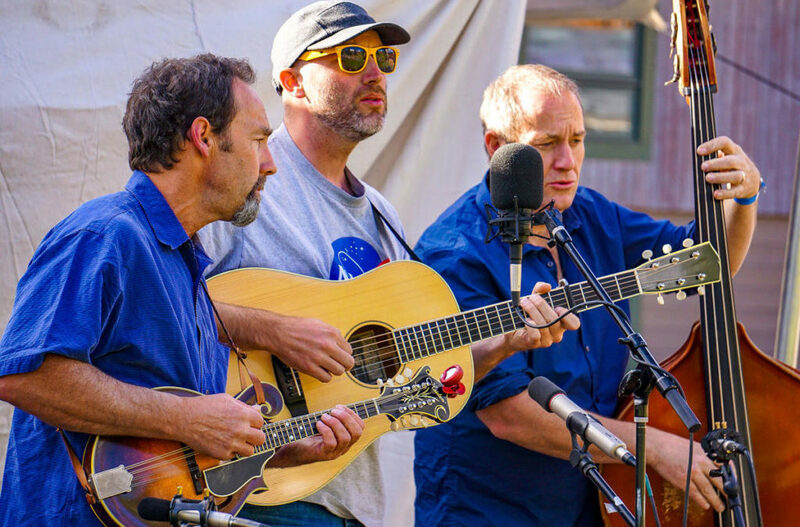 I spent many summers of my youth watching his band Loose Ties play at festivals across the West, and whatever formidable acoustic group Eric Thorin is part of is something you want to hear. He’s a huge inspiration to me, and one of the nicest humans you could ever encounter. Did I mention I love Targhee Music Camp! I go to camp for the music hero hang. Last summer’s camp was really special to me, a graduation of sorts. I started playing the Targhee Bluegrass Festival with my youth bluegrass band String Fever in the early 90s, and attending the band camp and festival again about 12 years ago after a hiatus from music. This album brings to light a fragment of my struggle, and standing in front of the music camp crowd at the student open-mic to sing “Battle Songs,” a song Eli put banjo and vocals down on, was scary and rewarding. My banjo was a little out of tune (sorry Danny Barnes who was in the audience! ), my voice shaky from trying not to cry, but I got through; a little piece of my heart laid out for an audience that could hardly understand the weight of all I was sharing. I am very excited to share my heart with all of you. My hope is that someone, somewhere can draw something positive from it, even if it is just a pretty melody and some Eli West!